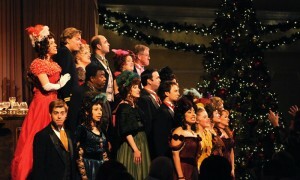 One of the things that I love about the holidays in San Diego are the performances! As an avid theater lover, I must admit to enjoying the tug at my heartstrings when attending a Christmas musical or a holiday play. So as a little gift for you, my blog-reading friends….a list of some of my favorite shows! I highly recommend that you try to see at least one of them this season. It’ll help you get into the holiday spirit! Lamb’s Players Theatre has 2 great options. Visit their Coronado theater to see their Festival of Music. This year’s musical is “It’s Christmas and It’s Live!” – a fun story set in the early 50’s that follows a young quartet trying to make it big on TV. Or if you REALLY want to be enveloped by the holiday spirit, visit the Hotel Del Coronado where LPT puts on “An American Christmas” – a night of singing, performances and a 5-course Christmas dinner – all in the beautifully decorated Hotel Del ballroom! Cygnet Theater puts on a fantastic stage version of a radio show performance of “It’s A Wonderful Life“. Whether you are old enough to remember listening to holiday stories on the radio, or just want to experience this classic story in a different way, Cygnet does a great job of spreading the holiday cheer in this fun-filled performance. 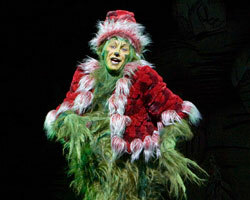 And any listing of holiday performances would be severely lacking without mention of the Old Globe Theater’s “How The Grinch Stole Christmas”! These guys go all out! From fantastic costumes, to vibrant set design – they even make it “snow” inside the theater! What a great performance to take the kids (and those who are still kids at heart) to! So, take a few minutes out of your hectic holiday shopping schedule and immerse yourself in a holiday wonderland for a couple of hours. You won’t regret it! This entry was posted in Arts & Culture, Attractions, Insider Tips, San Diego Events and tagged cygnet theatre, holiday, old globe, san diego symphony orchestra, theater, theatre, things to do by Benjamin Eastman. Bookmark the permalink.